Stoma Covers, also known as Tracheostomy Covers, are important Trach Care Supplies needed to properly care for the throat stoma after the larynx is fully or partially removed due to throat cancer. The stoma provides a new hole at the base of the neck as an alternative airway route to breath. The stoma cover is a device created to shield or protect the stoma to allow a person to shower. Stoma covers are not intended to be worn to protect stoma while swimming or participating in other water activities to prevent dangerous moisture buildup. Vitality Medical offers stoma covers, shields and barrier film products to form water barriers for showering. There are products with neck bands to protect the stoma like the Shower Shield Stoma Cover that's lightweight and fast and easy to apply using a unique Velcro fastener. This design is more convenient than fastening with tie-backs. Another option is using a shield that directly adheres to the skin. 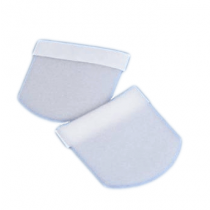 The Stoma Guard ShowerShield secures around the stoma using a gentle adhesive. The disk has a front clear rubber housing with opening for unobstructed breathing. This allows a person to shower freely without worry. 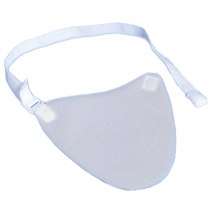 The last waterproof option to apply to the stoma region is a barrier film. This No Sting Barrier Film designed by 3M is a unique product that's for one-time use. 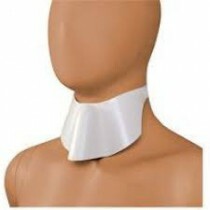 It's a transparent and breathable film that conforms well to the contours of the neck. It's easy to apply and dries quickly and dissolves in a solvent when needing to remove the film.